Lunch - Salad in a jar? Living the low-carb life isn't always easy when it comes to snacks or even lunch on the go. How can you combine healthy eating with saving money whilst also stimulating the most creative parts of your brain? By preparing Simply Salad in a Jar! Do you identify with any of these lunchtime problems? If I prepare my salad at home in the morning, it will be soggy by lunchtime. Have you seen how much prepared salads cost these days? How can I be sure of the quality of ingredients in my store bought salad? Placing your preferred salad dressing at the bottom of the jar means that only the base gets moist. So if you're adding heavier ingredients such as avocados for example, they're a great choice to go down low in your creative salad mix. Always leave the salad leaves at the top since they are the ingredients you want to keep fresh and crisp. At work or college or wherever, find some space in the office fridge to keep your salad cool and then, just before eating, give it a good shake. Any wide mouthed containers such as large jam jars or Mason/Kilner-style preserving jars work well... use whatever you have available as long as you can close it firmly. We know some people who mix it in a bowl first, others who then pour it out onto a plate but there are also the die-hard salad-in-a-jar fans who insist on eating straight from the jar - and personally, I'm one of them. In countries like France and Belgium, you are just as likely to see mayonnaise used as a salad dressing as the traditional oil and vinegar mixes. It's easy to make and keeps for up to a week in the fridge. Some people are still concerned about using fresh, uncooked eggs, but today in Europe, even 90% of supermarket eggs come from chickens who have been vaccinated against salmonella. In the US, this is not always the case - unless you have farm eggs, pasteurised ones are usually recommended. Getting egg and oil to form a balanced, creamy and above all stable emulsion, is easy as long as you take a bit of time. You can whip it up by hand; first the eggs, then adding a little vinegar and mustard and finally the oil, going in drop by drop at the start. Or you can use a hand blender in the same way for the failsafe and quickest approach. ​Feel free to add a clove of crushed garlic or some freshly minced herbs herbs, and if you need a thinner version as a salad dressing, just whisk in a little water. By the way, this mayo is gluten free, low-carb and lactose free! ​Use your creativity to make the most attractive and the tastiest 'salad in a jar' with these recommended salad dressings. And underneath, there's a foolproof way to make your own delicious, plain old mayonnaise. For the record, Heinz Salad Cream contains 20gm of carbs per 100 ml. Your home-made 'mayo' contains none! Wash and cut some chicory root leaves. Their bitter taste goes nicely with crumbled blue cheese (roquefort works well) and walnuts. Add a little virgin olive oil and a dash of balsamic and it's a quick delicious treat. 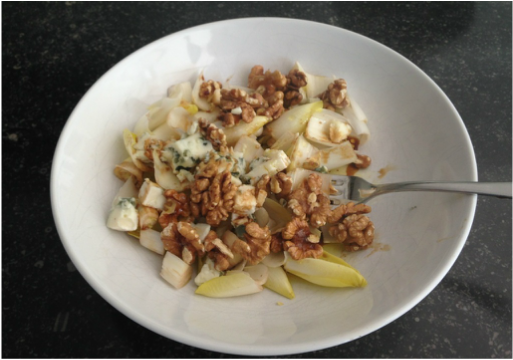 Eat in a bowl or if it's for lunch, put it in a jar with the dressing first, then the leaves and on top, the blue cheese and walnuts. Quantities are up to you, but as you can see, I love the taste of those omega 3 walnuts!! According to Professor Tim Spector; "The best prebiotics are chicory roots, Jerusalem and globe artichokes, leeks, onions, garlic, celery, bananas, apples and pears."